Education is key for girls to obtain the skills they need to escape poverty. These are the words of 16-year-old Joyce, who took part in Zambian Girls 2030, a five-year girls education programme, from UNICEF and the London Stock Exchange Group Foundation. Zambia has made considerable progress in improving the provision of education: most children attend primary school; there are equal numbers of boys and girls in lower primary school; and completion of primary school (grades 1-7) has risen markedly over the past decade and a half. However, less than 60% of children progress from grade 7 to grade 8. 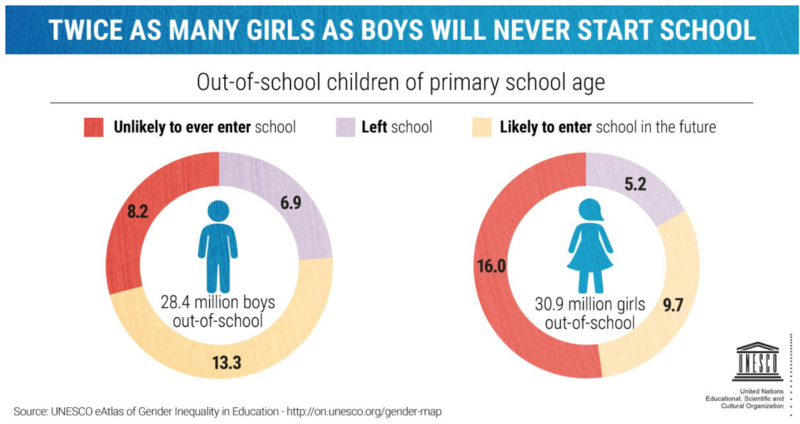 The rate of girls dropping out from grade 7 onwards is almost twice the rate of boys. Common reasons for dropping out are a lack of financial or parental support. Adolescent girls are disproportionately affected by child marriage and early pregnancy. A total of 16,000 girls dropped out of school in 2014 due to pregnancy. While Zambia has a re-entry policy which encourages girls to return to school after delivery, less than 50% do. When girls are forced to marry young, they are often pulled out of school at a critical age in their development: the transition from primary to secondary education is a key period for girls to obtain the skills for life and work that they need to escape the cycle of poverty. The aim of the Zambian Girls 2030 programme is to improve the participation of girls in Zambia’s social development, helping the country to realize its aspirations to achieve the UN’s Sustainable Development Goals. In 2006, the Zambian government established its first long-term written plan for the country, called ‘Vision 2030’. It sets out the goals and targets for Zambia to become “a prosperous middle-income nation” by 2030. This plan outlines three scenarios and development options: the baseline, the preferred, and the optimistic scenario. The socio-economic development objectives of the preferred scenario include gradually increasing annual economic growth rates from 6 to 10% by 2030 and significantly reducing poverty levels and achieving education and access to healthcare for all. Evidence shows that educating a girl has a ripple effect that will improve the lives of all of those around her. Zambian Girls 2030 focuses on engaging adolescents, especially girls from the provinces with the least favourable equity indicators, including: Muchinga, Luapula and North Western. The girls benefit from school level career clubs, career and skills mentoring and guidance, entrepreneurship and financial literacy education, and internship placements with companies, including telecommunications and water utilities. Skills development particularly focuses on science, technology, engineering and mathematics (STEM) related fields. Those participating often arrive in awe of the big city of Lusaka – seeing tall buildings, swimming pools, computers and offices for the first time in their lives. The mentoring and internship placements are complemented with an annual motivational camp, where the impact of their experiences is most apparent. Girls share advice amongst their peers on being confident, learning from failure and “being careful with boyfriends”. There is always a big cheer for the slogan ‘school first, marriage later’. The programme, which started in 2016, has so far reached almost 10,000 girls through weekly school clubs in 200 schools, while 829 girls have participated in career camps, and 233 girls have attended two-week internships. There are plans for an extension of the programme for scaling up in the two provinces (Northern and Southern) with the lowest primary to secondary transition rate, low Gender Parity Index, high drop-out at secondary level, and low survival rate from Grades 1-9. Educating girls is the one consistent determinant of progress for practically every development outcome, from reduction in mortality rates, to economic growth, and democracy. Zambian Girls 2030 provides a space where girls can exercise their agency, make their voices heard, and access their first leadership opportunities. If Zambia is to be successful in achieving the ambitious goals set out in Vision 2030, it will be critical to have a generation of girls who are educated, confident and equipped with the skills they need to participate meaningfully in the development of their families, communities and in their country.